Royal Drottningholm Golf Club is just a few kilometers from the home of the Swedish Royal Family. 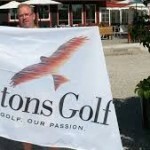 Royal Drottningholms Golf Club’s 18 holes situate on Crown property. 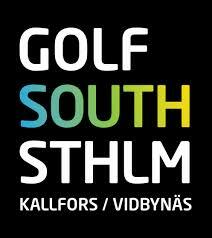 Drottningholm is a well known and highly respected golf course in Sweden. The noted Swedish golf course architect, Rafael Sundblom, designed Drottningholm. There were many drafts developed before the plan was finally decided. There were lots of suggestions, not the least from contradictory leaseholders. Unfortunately, Sundblom never saw the finished product. He died in 1958 and, Nils Sköld, a protégé of Sundblom, continued the project. The new club had great support from King Gustaf VI Adolf. He opened the course at a banquet on September 26, 1959. There’s a story that the King became psyched for a game at the opening ceremony. So much so that he held up a waiting dinner and disappeared on the golf course with friends. In October 2010, a major renovation of the course began. The architect, Johan Benestam, captured the essence of Drottningholm. While insuring the course will meet future demands. Players enjoy a golf course with great variety and unique character. The course has park like character, where the first nine holes play in open landscape. The back nine weaves through a woodland setting. Benestam’s upgrade includes a total redesign of fairways, greens and bunkering. He kept Sundblom’s original layout. Fairways undulate and are well defined. All hazards are visible from the tees, as the classic designs from Mackenzie and Ross. Water is hardly in play save the wonderful finishing hole, #18. Greens are all about the same size and just wavy enough to demand putting control. Drottningholm hosted The Scandinavian Masters in 1991 and 1994. This tournament continues to be a European Tour stop. To Scandinavians, Drottningholm will always have a place in golf’s history. Jack Nicklaus participated in the first Volvo Open competition here in 1970. 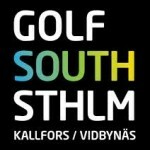 The Volvo Open is the first big international golf competition in Sweden. Royal Drottningholm has many qualities, including a good spirit and atmosphere. It is a club where golf always takes first place and titles and status have always been of little importance. Royal Drottningholm remains a family club with an excellent golf course and a clubhouse. The club offers one of the best practice facilities in the country. It is not a rarity to see local professionals using this practice center. Royal Drottningholm offers a full service restaurant with seating that overlooks the 18th green. 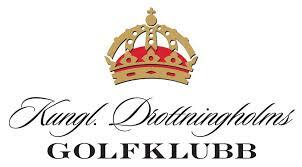 Royal Drottningholm Golf Club is a private club. But green fee play and corporate events are welcome. There are 64 “Royal” golf courses throughout the former British Commonwealth. There is only one in Sweden. The British Royalty designated all the Royal Commonwealth courses with pomp and ceremony. I asked how Drottningholm GK received its Royal designation? “We asked them,” was the response. How quintessential Swedish for this anything but typical golf course. On this holiday, thirteen years ago, I came home from work and changed my clothes. It was a sunny day, that is not a rarity in South Florida, but it was fairly mild temperature wise so golf was the decision on how to spend the afternoon. I decided to walk, which is rare in South Florida golf. Most people ride motorized carts. Delray Beach Muni allows walking and also boasts nine holes designed by the great Donald Ross. So it was off to play golf. Little did I know how that decision was to change my life. Stepping up to the counter, I announced my intention on how I wanted to play. After taking my money, the counterman turns to a woman in the pro shop and says that I might be kind enough to play with her. After our introduction and a few putts on the practice green we were off. Lucky for me, the stigma of tees was not an issue to me. I had rectified that playing from any tee was the same golf course only using different clubs. I asked the young woman from Sweden if she would like me to play from the forward tees with her. I just thought it more conducive to have a social round. By the turn, I was captured and spent the back nine trying out various scenarios that would extend our time together. Alas, at the end of the round, the clubhouse lounge was closed so I couldn’t invite her to the 19th hole. But I did carry her bag (just a small pencil travel kit) to her car and tripped all over myself getting another date with her. As the poets would say, I was smitten. Well, since that fateful day, I followed Eva to Stockholm almost a year later to the day. We have been a twosome ever since. I can safely say that I have played more rounds of golf with Eva than any other person on earth. We have played above the Arctic Circle and in Europe, Morocco and the USA. Eva has changed my life in so many wonderful ways. I am a better person for knowing her and, much to my detriment, I don’t let her know it enough. But I’m here to tell you all, especially her, that Memorial Day 2004 is memorable to me. It was kismet that brought us together. It was my lucky day. With all the world watching, with all the pre-tournament noise, the 146th British Open came down to two men. The rest of the field played this Open like a weekend gathering of golfers that you and I would enjoy. Just a few miles from Prestwick, where the Open’s time began, two golfers played four rounds of golf for the Ages. One golfer stood on the 18th fairway of Royal Troon, six under par for his day, and was two strokes behind his fellow competitor. The golf course, the weather and Phil Mickelson threw everything they had at the winner from Sweden, Henrik Stenson. He didn’t just overcame those deterrents, he dominated them, playing better and better each day. On Sunday’s final round, normally a knee knocking, nerve rattling day for anyone in contention, Henrik Stenson fired 1o birdies at the Royal Troon links. In 2002, Henrik Stenson ranked 336th in the golf world. As late as 2011, Stenson was ranked #211. 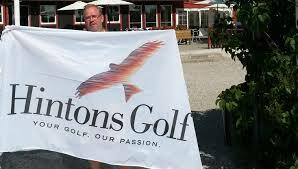 Watching Stenson play was not a matter of if he would melt down but when. That same year, Stenson had not qualified to play in the PGA Championship, so he opted to play for his club championship at Sweden’s Barseback Golf Club. He lost, finishing second to Henrik Hilford Brander. Not only has the weight of not winning a major been lifted off of Stenson’s back but that weight is off the country of Sweden, as well. Sweden delivered major winners in woman’s golf but, until today, never a man. In one round of golf, Swedish golf is now, itself, a major. Players designing golf courses started from the game’s earliest years. I mean, who else would have taken land only fit for sheep and turn it into a golf course? Only people who loved the game, like Christian Lundin, golf course designer. When Bobby Jones gave his thoughts to Allistir MacKenzie could be the beginning of the player/course designer relationship. Later, Jack, Arnie and Gary started their own golf design companies, riding on the name recognition of their playing accomplishments. All of those icons hired designers to execute their ideas. It’s now commonplace for professional players to translate their playing experiences into golf courses. While the trophies gather dust on the shelves, to design a golf facility that people will enjoy for decades is very appealing. Faldo, Seve, Sorenstam and Woods all have designs in place around the world. The latest player to enter this enterprise is the Swedish professional , Henrik Stenson. Following in the footsteps of fellow Swede and Ryder Cup player, Pierre Fulke, Stenson wants to design golf courses highlighting his experiences as a player into vision. Stenson wants to incorporate risk and reward into his golf courses, something he likes as a player. Not surprisingly, Henrik wants a simple design, yet each hole to have its own character. It must be enjoyable for all levels of golfers. While the better golfer can challenge the risk to get his reward, the higher handicap player has a safer route to the hole that would only drop a shot to par. Does the professional golfer put down his clubs and take up a protractor? He could if he has some degrees in architectural design. So, he finds a designer who is a kindred spirit, someone who believes in the same vision for golf courses as he does. In Henrik’s case, he turned to the Swedish designer, Christian Lundin, of the firm reGolf. Growing up in the Swedish area known as Småland, Christian Lundin was devoted to soccer, as are most boys in Sweden. He loved to play all sports but soccer was his favorite and he became pretty good, despite his dislike of practice. A serious injury forced him to hang up his soccer boots. His doctor suggested he take up golf, saying it was a game Christian could play for the rest of his life. 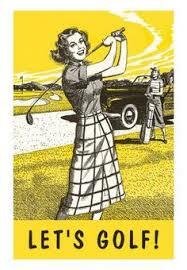 Christian took to golf but his dislike of practice remained. However, he began to take interest in other aspects of golf. Scoring became less important as Christian began to understand the strategy and how landscaping of the golf courses helped form that strategy. The deeper he delved into this side of golf the more he became interested. Like any artist, Christian has his influences. Masters like MacKenzie, Ross and H.S. Colt. Lundin is particularly influenced by Tom Simpson, who was an eccentric character, almost certainly a little crazy. Simpson was one of the breed of gentleman amateur architects as opposed to a golf professional turned designer. He was a fervent believer that golf should be an intellectual battle and not a physical one. Some of Christian’s favorite courses are, to no surprise, the links courses of Ireland. Some of those courses are County Louth near Dublin, Ballybunion near Kerry and Carne, located in a wild dune area on the tip of the Mullet Peninsula in County Mayo. Christian had put in a bid to rebuild some bunkers at Österåkers GK, outside of Stockholm. Then, the club changed course and decided for a complete redeisgn. Another designer nearly received the contract when Henrik and Christian asked if they might bid? After a meeting with Österåkers principles, the duo were awarded the contract. From now until 2021, when the final phase will be complete at Österåkers, Henrik Stenson Design will be working on the modernization of already one of Stockholm’s premier golf clubs. While Henrik Stenson himself will be deeply involved with the project, it will be Christian Lundin that will turn Henrik Stenson’s ideas into a golf course. Maybe I should reserve a tee time, you think? 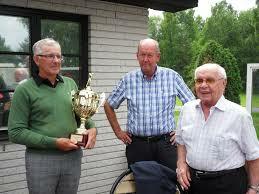 It was at the 2010 Scandinavian Masters, at Bro Hof Golf Club, just outside of Stockholm. It was held the week after the British Open hoping that some stars would spend two weeks in North Europe and play the Swedish event. Louis Oosthuizen, the 2010 Open Champion, did play that year. He already made the commitment. It was late in the afternoon on Tuesday of the championship week. The course was getting quiet and the fairways had cleared of fans watching the players practicing. The players were returning to their accommodations to rest up for Wednesday’s long day of the Pro/Am. I was cutting over fairways to get back to the clubhouse when a lone player and his caddy came walking down the first fairway. Most players play with friends during practice rounds but David Lingmerth and a buddy carrying his bag, were by themselves. I met David a few weeks before when he was competing for Sweden in the European Team Championship. Sweden had made it to the finals, but ran out of gas on the final day and came in second to the team from England. Lingmerth didn’t have his best weekend, finishing at four over. Watching him on that final day, I saw a young man determined to finish the best that he could. With his jaw set and a physique built for hockey (which he played), if he had been wearing a helmet, he would have pulled the chin strap tighter and stepped it up a notch. Last week, I was talking about David with a colleague. The colleague offered that David was the most “Americanized” of the Swedish professional golfers. Coming from the small Swedish town of Tranås, David was probably introduced to the USA by his uncle, Goran Lingmerth. Goran was the place kicker for the Northern Arizona University football team. He still holds the NCAA Football Championship Subdivision record for single-game field goals (8) and points scored in a game (24). Goran was placed into the NAU Athletics Hall of Fame in 1996. Goran Lingmerth got to know members of the Solheim Family, who owned PING. It resulted in a job offer and a life in golf to this day. Because of his career in the golf industry, Lingmerth had the opportunity to instill the game of golf in his young nephew, David. They would play golf during summer trips to Sweden and, as Goran was the PING rep to the LPGA, hit balls at Florida country clubs with LPGA golfers on trips to the states. David’s game developed over the years. He played for the Swedish National Team and played in the President’s Cup. When it came time to seek out opportunities in college, Goran helped David get a scholarship at the University of West Florida, where he was an All-American and won a tournament as a freshman. His breakout season led to a transfer to Arkansas, a runner-up NCAA finish, and, three years later, a chance at a pro career. David played on the Nationwide Tour in 2011 and just missed his PGA TOUR card by one stroke at the Nationwide Championship. In 2012, he made progress by winning his first event and earning a PGA Tour card by his position on the money list. David, in his second career start on the PGA Tour, finished as a joint runner-up at the Humana Challenge after losing in a three-man playoff. Shooting a 10-under-par round of 62 in the final round to get into the playoff, he was eliminated at the first extra hole after finding the water with his second shot. At the 2013 Players Championship, David led in the third round, finishing T2, two strokes behind Tiger Woods. A sign of Lingmerth’s mental toughness was at the 2015 Memorial Tournament. 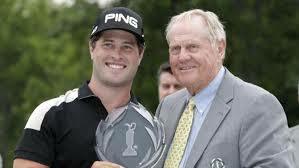 Again, David was in a playoff to win Jack Nicklaus’ prestigious event. David beat Justin Rose in the third playoff hole to earn his first PGA Tour win. On that fairway in 2010, David and I said a few friendly words to one another and I wished him luck in the Scandinavian Open and he walked away to continue his practice round. I watched them stride off alone thinking, maybe, my good luck wish really was for David in his attempt to be a professional golfer. I knew it would be hard for the rookie. No tour friends, no sponsors and a formidable road ahead. We all know that many have tried but few have succeeded. This weekend, in winning the 2015 Memorial, it seems my good luck wish for David is coming true. Today I received a very nice e-mail from another noted Swedish golf course designer, Peter Nordwall. A Nordic golf course architect, Peter Nordwall is best known for his Swedish courses Bro-Balsta and Svartinge which both have their fans and elements to admire. Bro-Balsta is the club where Annika Sorenstam learned to play golf and its main course is a surprisingly attractive layout that occupies rolling countryside thick with pine and birch. Most of the putting targets are very large and built with tiers, shelves or swales – the moguls on the 9th are crazy! 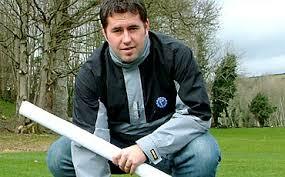 This is a popular club, however, as the facilities are excellent and the turf conditions generally quite good. The 12th hole, modeled on the 16th at Augusta National, is also an attraction for those in Sweden who haven’t seen the original. With a layout kept in great condition, Svartinge Golf Club is a very private club with only a few hundred members. These fortunate golfers enjoy games on pristine playing surfaces and also get to test their skills against one of the regions most attractive designs. Svartinge is a good golf course, and the club resembles The Grand in Australia for the setting and nature of the establishment. We asked Peter to give us some of his thoughts on Sune Linde. Was he an influence for you? “Not really. Although he was 15 years older than me, we happened to start our course architect career almost at the same time and I had then already formed my design philosophy,” he said. 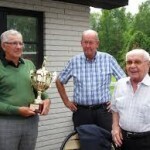 One of Sweden’s leading course architects, Sune Linde, died of complications following surgery last week. Mr. Linde was 90 years old. Sune Linde was one of Sweden’s great course architects, designing fifty Swedish golf courses. His designs are some of Sweden’s best golf courses, Frösåkers GK, Forsgårdens GK, Arlandastad Golf Club and his home club, Nyköping GK. He designed over 50 of Sweden’s golf courses and, today, thousands of Swedish golfers enjoy playing on his visions. In the early 50s, Sune Linde met architect Nils Skold and he designed his first golf course, Ärila, with Skold. The Ärila club changed its name to Nyköping GK. Nyköping was Linde’s home course, where the Club hosts an annual event named the Sune Linde Cup. ” Sune was a great Nykoping figure and one of Sweden’s major architects. He will be missed at the club. 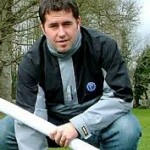 He was very active right until a few years ago because of problems with his eyes,” said Nyköping Club Manager, Gary Cosford. Swedish Golf Online contacted some of Sweden’s leading golf architects to get their thoughts on Sune Linde, the man and his designs. 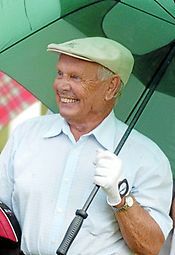 Pierre Fulke played fifteen years on the European professional tours and was a member of the winning European Ryder Cup team in 2002. Since his retirement he has been busy designing golf courses. Three of Sweden’s best golf courses, Ombergs (his first), Grönhögens and Visby have all been shaped by Pierre. Pierre met with Sune only a few times, but when he did he found the man, “…funny, witty, just a fun guy to be around. I really enjoyed him as a person.” To illustrate what he meant, Pierre told a story of he and Sune driving around on one of Sune’s golf courses in a golf cart. They came to one hole where the green is perched on a hill, all but hidden from the fairway. We will have more recollections from fellow architects in the next edition. 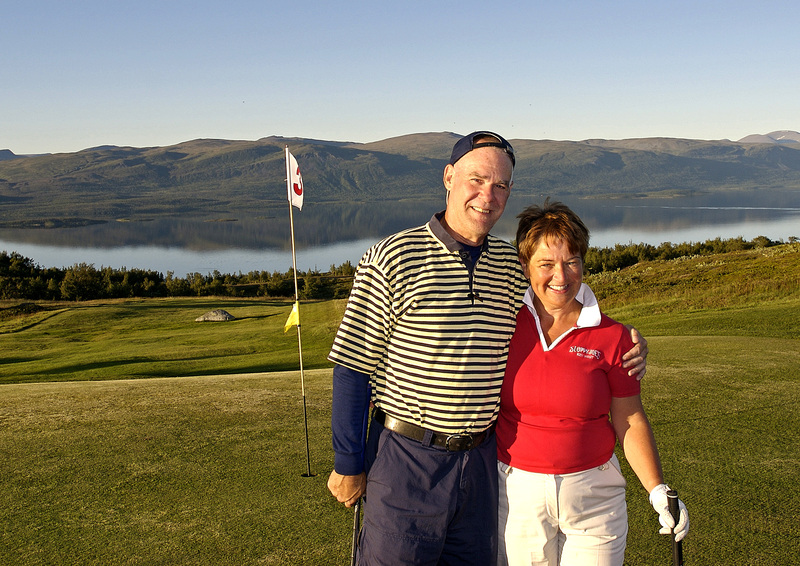 In 1995, I began a collaboration with Peter Cordén, when we worked on our book, “The Swedish Golf Experience.” In 1997, we published our work and you may be able to find an odd copy on an on-line book seller, maybe not. The picture on SGO’s home page is by Peter. He took it at almost midnight at Bjorkliden GK 250 kilometers above the Arctic Circle. Amazingly, after working together for two years, we still remain close friends and trade off services between ourselves and dream about The Swedish Golf Experience 2.0. I would be remiss if I didn’t mention the yeoman’s work that my girl, Eva Waitzfelder, did keeping the train on the tracks and the two of us from drifting away. On May 6, I had the pleasure of being a part of Peter’s latest book release. In the main room of the UniPeg Golf store in downtown Stockholm, a good gathering of friends and family gathered to celebrate with a few drinks and good cheer. The book is called, “Golfilicious,” a collection of great memories from some of Sweden’s top golf professionals as well as anecdotes from other Swedish celebrity golfers. Included are recipes from Sweden’s brightest golf restaurateurs and chefs. While turning the pages, your eyes can rest on photos from some of Sweden’s fantastic golf courses. Peter’s partner in Golfilicious is Jenny Olsson, an independent freelance journalist writing everything from editorials and personal portraits to press releases and shorter news items. Jenny is experienced from the daily press, monthly magazines, customer magazines and the web. As I said I have worked with Peter for many years and, IMHO, he has a wonderful eye for the nuance of golf courses he brings to his photos. He belongs in the elite of, certainly, Swedish golf photographers. He is constantly on the move between jobs in Sweden and the world. He gathers his work under the tent he calls “Golf is Art.” I think, turning the pages in “Golfilicious,” you will get the same impact that I get. As I tell people, Peter could make a runway at Arlanda look like a pristine fairway. 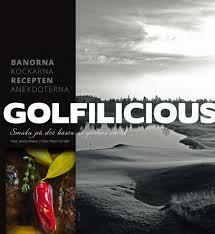 Available only in Swedish, the book is called “Golfilicious” and you can get a copy here. Don’t worry about the language, like they say, one picture is worth a thousand words.